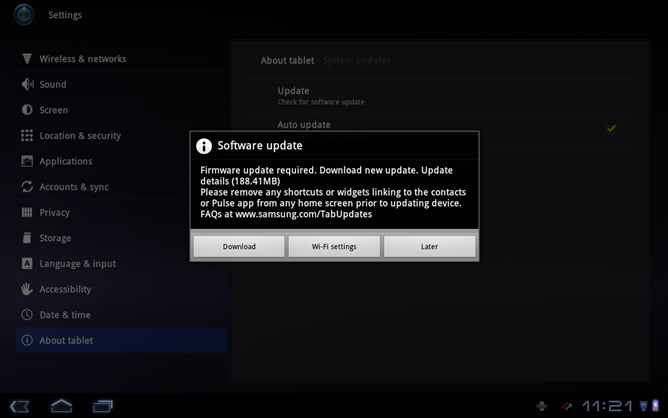 Samsung Galaxy Tab 10.1 WiFi TouchWiz UX Update Is Now Live! To all those who have been [im]patiently waiting for the Galaxy Tab 10.1 OTA to go live, wait no more - the update started rolling out at exactly 12:00am EST. 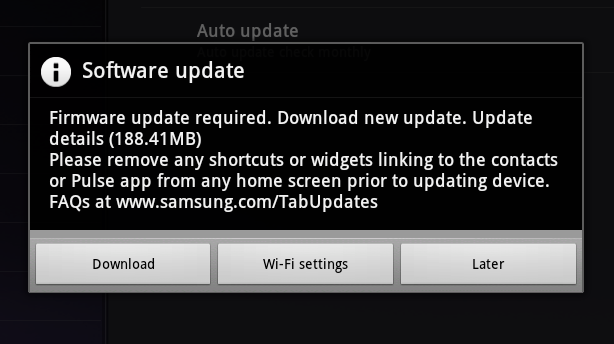 This update brings a whole slew of awesome to the Tab 10.1, including TouchWiz UX and all of its added benefits. I know there are a lot of skeptics out there since this is the first major custom overlay to hit a Honeycomb tablet, but judging from the early reports, it has been very well received. Live Panel: Magazine-like widget view for immediate access to weather, social updates, email, news, photo gallery, all on the home screen. The visual layout of Live Panel is completely customizable for one-touch entry into each user’s most important information. Mini Mode Tray: One-touch access to commonly used applications—Task Manager, Calendar, World Clock, Pen Memo, Calculator, Music—which overlay in a pop-up window on display screen for powerful multi-tasking. Clipboard: Advanced copy & paste functionality allows Galaxy Tab 10.1 users to store photos, Web pages, YouTube links, etc., on the clipboard for easy sharing via email and social network sites. Indicator Quick Panel: Quickly toggle on/off Wi-Fi, notifications, sound, brightness and settings in lower right hand corner of the Galaxy Tab 10.1 display. It also brings several more subtle changes as well, including enhancements for the keyboard dock, smoother animations, world clock, and many more. To check for the update manually, grab your Tab and hit Settings > About Tablet > System Updates. Enjoy!